All Progressives Congress (APC) as their sole candidate for the November 18, 2017 governorship election. The stakeholders who are mainly traders and artisans in the Anambra senatorial zone of Anambra state under the auspices of Anambra state Amalgamated Traders Association stakeholders and Elders, it appears Governor Willie Obiano has lost the re-election campaign. Ashiwaju.org gathered that Paul is actually ready to take over the mantle of leadership from the incumbent Governor Willie Obiano and he did not mince words in saying so. Yesterday, APGA led by Victor Ike Oye endorsed Obiano as their sole candidate for November 18 election. Barely 24 hours of their endorsement, Elo Afoka wrote a public letter insisting that he is still in the race under APGA platform. Does it mean APGA won't give Afoka chance to contest against Obiano for the party's ticket? A Lecture to Mark the Third Year Anniversary of His Excellency, Governor Willie Obiano, on 17th March, 2017: Governor’s Lodge, Awka. Every anniversary is a time for thanksgiving as well as time for deep and sober reflections. Since 1999, no consecutive three years have seen such level of turbulence and crisis in Nigeria’s economic and political life as the last three. Oil price collapsed, government revenues came under immense stress, exchange rate and inflation are at all-time high since 1999, unemployment has soared, insecurity and youth agitations intensified, workers and pensioners are owed by most state governments, poverty is escalating and the economy is in recession. Governing a state in Nigeria where you do not have control over much of these macro variables must be extraordinarily challenging. For Governor Obiano therefore, this third anniversary must be time to thank God for His mercies--- for survival and progress! Let the truth be told: in the context of Nigeria’s situation over the last three years, and in comparison with other states, or even in comparison with past governors in their first three years, Governor Obiano has without question done very well. I will return to this later. However, I must also add that there is still a very long way to go, and I am sure Governor Obiano will be the first to acknowledge this. Perhaps this is the reason he chose to mark this anniversary with a public lecture—to brainstorm on the road ahead, and I am glad to lead the discussion. As a work-in-progress, Nigeria is at a critical juncture, requiring fundamental economic and political restructuring en route to a more perfect union. If Nigeria can get its acts together, this moment offers a perfect opportunity for creative destruction and transition to a post-oil economy and a more balanced and stable federation. However, while we wait for the federal government to do the needful and provide leadership to the country, Ndi Anambra must unite to exploit our God given potentials to build a new prosperity corridor—a prosperous homeland for the globalizing tribe (Ndigbo)! I was given the liberty to choose a topic for this lecture. As I reviewed my lengthy keynote address to the 2nd Anambra Development Summit in May 2006 entitled “Anambra 2030: Envisioning the African Dubai, Taiwan and Silicon Valley”, the recent powerful but exhaustive treatise by HRM Igwe Achebe (Obi of Onitsha) on 3rd October, 2016 entitled “Aku Lue Uno”, as well as Governor Obiano’s Plans and Programmes, it was difficult to say more. However, I have chosen to simply challenge us to action (let us walk the talk) by framing my lecture on “Anambra: An Emerging Start-Up State and Our Collective Challenge”. I recommend the book by Dan Senor and Saul Singer entitled Start-Up Nations: The Story of Israel’s Economic Miracle. In many ways, Anambra/Alaigbo is potentially comparable to Israel or some other new start-up countries/societies. I believe we have useful lessons to learn from Israel as well as several other global tribes (Jews, Anglo-Americans, Indians, Chinese, etc.) with experiences in building prosperous homelands-- on the kind of creative destruction and innovation that must underpin the revolution to jumpstart Anambra as an island of security and prosperity. Countries/societies that have recently achieved spectacular economic miracles such as the type that Anambra aspires to (see for example: Singapore, Malaysia, South Korea, Dubai, Taiwan, Israel, Ethiopia, Rwanda, etc.) have three key features: i) They got some fundamentals right and kept doing them right over an extended period. Li Kuan Yew was asked to explain Singapore’s economic miracle, and he retorted that there was no miracle. According to him, they got a few things right and kept doing them for decades; ii) A grand vision and a Grand Plan (broadly owned with elite cohesion around the Plan) such that successive governments kept moving within defined trajectory; and iii) Longer-tenured governments to cement the vision/Plan instead of the four yearly turnovers with policy reversals and false/fresh starts. How does Anambra measure on this scale? Our thesis is that Anambra has begun the journey but that Ndi Anambra need extraordinary cohesion, new thinking/orientation, new politics, and different actions to accelerate the momentum for the economic miracle of the 21st century. Yes, We Can; and So, we should! Wealth creation in the world will continue to be driven by skills and technology. Old money –based on brick and mortar – especially derived from low value-adding activities (rents, primitive accumulation, informal/underground and criminal economy, and wealth from primary commodities) will continue to suffer rapid destruction and replacements. As mega cities emerge; populations moving faster than before, and ICT/ robotics replacing much of human labour, only those who PLAN, and continuously innovate and adapt will survive. Is Anambra fit for purpose to prosper in the evolving world? Anambra state, with 4,887 sqkm of land mass, is Nigeria’s second smallest state (after Lagos state—although they might swap positions given that Anambra is shrinking due to 900 erosion sites while Lagos is reclaiming parts of the Atlantic oceasn). It also has the second highest population density after Lagos state. With 60% urbanization rate (again, second only to Lagos), Anambra will, over the next 50 years, no doubt become one mega city—with a population approaching 20 million! It is strategically located to become a commercial and industrial hub—with boundaries with the North through Kogi, South-South through Delta and Rivers, and the South East through Abia, Imo and Enugu. Its latest population estimate is over 5 million (10th most populous state in Nigeria). It is estimated however that over 50% of Anambra indigenes (perhaps more than another 5 million people) live outside of the state--- in other states in Nigeria as well as outside of Nigeria (all constitute the Greater Diaspora), whereas the state attracts a diversity of immigrants from all over Nigeria and the world. Anambra is indeed a home for all. In literally every village, ‘non-indigenes’ are becoming a significant share of population at home--- especially those hired as security guards, and Okada drivers. Onitsha, Nnewi, Ekwulobia, Otuocha, Ihiala, Umunze, Awka, etc. have become rapidly urbanized. In 2006, I asked if there were white people living in Anambra as an index of a modernizing state. Today, not only are there several foreigners but Chinese are fast making Anambra a home, with estimated over 400 of them in the state. There are now several institutions in Anambra where Chinese language is taught to thousands of enthusiastic Anambra people. Anambra’s GDP was estimated at US$13.5 billion as at 2014 or about 3% of Nigeria’s GDP. If Anambra were a country, its GDP would rank about 122 in the world or about 24th in Africa (out of 54 countries). Anambra’s economy is probably 4th among the states – after Lagos, Abuja, and Rivers. Currently the majority of the population are engaged in distributive trade, agriculture, transport and services, real estate and construction, micro, small and medium industries, mining, financial services, and other services (health, education, law, etc.). A friend once joked that an average Anambra person is born with a B.Com (Bachelor’s degree in Commerce) in reference to the famed entrepreneurial acumen of the Anambra people. Onitsha was and perhaps still is, the largest commercial market in West Africa. The natural resources include: natural gas, Crude oil, Bauxite, Kaolin, Salt, Gypsum, Lead, Lignite, Limestone, Iron ore. Much of the soil (except those ravaged by erosion) is arable for Oil palm, Corn, Rice, Yam, Cassava, Tomatoes, cocoyam, etc. Tourism potentials remain untapped. Adult literacy is over 80% and there are five universities (soon up to seven), a polytechnic and two colleges of education in the state. A noteworthy feature of Anambra state at the moment is that it is a net exporter of capital. A large proportion of its most talented/skilled indigenes live outside of the state, while a larger proportion of investible capital is deployed outside of the state. Poverty incidence in Anambra used to be the lowest mainly because of remittances by its Diaspora. The skyline of Anambra is adorned with thousands of four-storey buildings whose collateral value is insignificant (largely dead or dormant assets). Access to bank credit is relatively low. For example Anambra has the 4th largest bank deposit (after Lagos, Abuja, and Rivers) but the size of bank loans granted to businesses in Anambra is a very small proportion of the deposits. This trend needs to change. The key point of the foregoing is that Anambra has a strong economic base and the human and natural resources/assets to accelerate the momentum of transformation. It is evident that Anambra has the potentials to become an industrial/commercial hub—and a true 21st century economic miracle. The book, Start-Up Nations…asks a pertinent question: “How is it that Israel – a country of 7.1 million, only 60 years old, surrounded by enemies, in a constant state of war since its founding, with no natural resources – produce more start-up companies than large, peaceful, and stable nations like Japan, China, India, Korea, Canada and the UK?”. Braughtigam in an article entitled “Industrializing in spite of the State” described Nnewi as the Taiwan of Africa. Despite the plethora of constraints—especially power and infrastructure deficiencies—Nnewi and Anambra entrepreneurs are still on the rise. Innoson motors—the Nigerian indigenous automobile company is a toast of that doggedness. Hundreds of new start-ups are emerging and succeeding in spite of the odds. We would need to plan for 20-30 million people in Anambra over the coming decades as Anambra fuses into one mega commercial/industrial city. At the moment, Anambra has a Governor who understands wealth creation. Security of life and property is the most critical factor for investment and Anambra under Gov Obiano is one of the safest (if not the safest) state in Nigeria. Anambra is institutionalizing change—remember the book entitled “Built to Last”?---There is a medium-term Plan and the State has also set up the Anambra Small Business Agency (ASBA) as well as the Anambra State Investment Promotion and Protection Agency (ANSIPPA)—which has attracted up to $5 billion private investment commitments to the state within two years. Thousands of direct and indirect private sector jobs are being created and this is remarkable at a time of economic recession. With the campaign for Aku Lue Uno, are we about to see significant escalation of start-ups such that in 10-20 years’ time, Anambra would be said to be an island of prosperity, an economic miracle with more start-up companies than most countries? Over the next several years, I can see the Second Niger Bridge (with rail line) that merges Delta with Onitsha/Anambra as a mega alternative to Lagos. I envision the skyline along the River Niger like the skyline of Hong Kong. In the next several years also, Anambra should be an international city—to be accessible by air, land and sea (Onitsha seaport). The new dynamic economy will make Anambra the first choice destination for high value-adding opportunities---investment and jobs. The buoyant economy will ensure that internally generated revenue (IGR) should not only cover all recurrent expenditures but also contribute to capital expenditures. It is all in our mind: strong positive thinking and self-belief will get us there! That is the Igbo spirit; that is the Anambra spirit. The narrative that we need political power at the centre to change our future is false. That will satisfy a psychological aspiration but will hardly change our material condition (check out Nigeria’s history and the correlation between power and economic development). Economic power is what is in our DNA---and that is the power that can endure. While Ndi Anambra/Igbo may be “marginalized” in terms of political appointments (for the elite that constitute less than 0.01% of our population), the average Anambra/Igbo person is doing far better economically than an average non-Igbo Nigerian (the inverted poverty figures partly show this). We must emphasise our strength and maximize it. While the FGN can help in certain ways, it cannot stop us. We need to look intensely at ourselves and our leaders and ask whether we are maximizing our potentials. The narrative that you need to have the head office of your business in Lagos or Abuja to be national or international is also false. In today’s ICT-driven business world, location is becoming irrelevant for administrative purposes. Our Nnewi brothers insisted on the Nnewi brand since the 1970s and the world has taken notice. We now need the Anambra brand--- and bring the world to Anambra! The history of emerging and dying cities show that no force, not even the rate of return on investment, can stop a people determined to write a new song for themselves. We must therefore stop reading the Book of Lamentations and star singing the songs of Solomon! My preferred narrative is that Ndigbo/Anambra are moving forward economically and will continue to get better! b) Maximizing the Networks of the emerging global tribe! Igbos constitute an emerging global tribe (like the Indians, Chinese, Jews, Anglo-Americans, Japanese, etc.). They are all over the world—with increasingly significant settlements in most African countries and an emerging force in certain business lines especially electronics and auto spare parts. They have a unique business practice based on social capital/trust. Through the apprentice system, the Igbos willingly and happily train and empower their future competitors in the same line of business. Currently, much of the businesses in the homeland and elsewhere in Africa are in the low skill, low technology sectors. However, Igbos are the only global tribe that does not have a prosperous homeland. It is also the tribe that its trading Diaspora do not sell goods manufactured in their homeland. 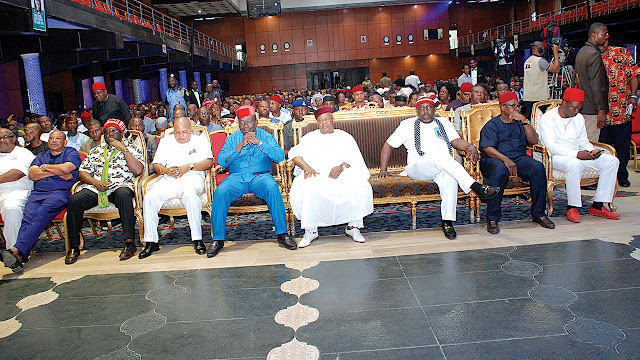 The disconnect between the homeland and Diaspora in terms of trade/business is one of the several reasons the Igbo language is dying among the Diaspora. Igbos therefore run the grave risk as the global tribe where the source of its dynamism via communication with the homeland may not last beyond the first and second generation of Diaspora. All these need to change. To innovate and upgrade rapidly will require adaptation and robust networking with other clusters in Diaspora as well as other global tribes. I am glad that Gov Obiano has a defined office for the Diaspora, and I hope we can evaluate the effectiveness of this officer by the number of businesses (and jobs therefrom) between the Diaspora and homeland. It is also gladdening to see the dynamic interactions between Anambra/Igbo businessmen and the Chinese. Our Governor can facilitate participation of targeted businesses in targeted Chinese Trade Exhibitions with a view to match-making and attracting even more businesses to the homeland. As costs rise in China and India, several of the industries there will be under pressure to relocate to cheaper cost locations and Anambra can compete to be the preferred destination. This is called the Flying Geese phenomenon and that is how the Japanese manufacturers built offshore subsidiaries in the other South East Asian countries. As we mainstream the networks between Ndigbo/Anambra and China/India in particular, it is urgent that the Chinese Embassy must set up a Consular Office in Awka or Enugu. I know the intensity of business relationships between Ndigbo especially Ndi Anambra and the city of Guangzhou and Shanghai in China. Consequently, an Anambra-Guangzhou-Shanghai Chamber of Commerce will not be out of place. As an emerging global tribe, Ndigbo/Anambra must think global but also act local. As a global tribe, we cannot be insular in orientation nor withdraw from the world. Igbos cannot all come home; it is neither wise nor feasible. Like the Jews, Anambra will probably continue to have more than 50% of its indigenes outside of the homeland. Given our entrepreneurial drive and high population density, our people will continue to need Nigeria, ECOWAS, Africa and the rest of the world to maximize our prosperity. But while we must feel at home everywhere, there is only one home that will never change—the homeland! Having an identity is not inconsistent with a global or national outlook. There are probably few who would question President Obasanjo’s patriotism as a Nigerian. But that has not made him to wear Isi Agu dress or our red cap to prove that he is “detribalized”. 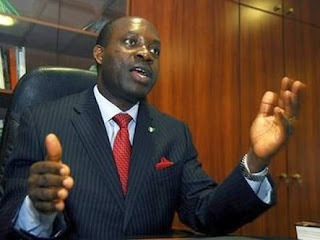 Furthermore, both Ota Farm and the Presidential Library and Home are all in his home state—Ogun. He did not settle in Lagos or Abuja to prove that he loves Nigeria. Of course, by our Constitution, you are first identified by your “State of origin” before anything else. We must not feel shy to campaign for and mobilize a new consciousness towards an “Anambra My Only Permanent Home” philosophy. God did not make a mistake to make us Ndi Anambra! While apologizing for the deportation of Ndi Anambra from Lagos, Governor Fashola also challenged us with a poser namely: why are you people running away from your own state? Many felt offended and reminded him that Lagos state was, for decades, built with Nigeria’s collective resources running into hundreds of billions of dollars as Nigeria’s economic and political capital until Abuja. For me, we should turn the provocation into a positive anger and a challenge to build a prosperous homeland---and our major hidden growth reserve, like the Jewish state, is our Diaspora resources scattered outside of the state. This reserve needs to be energized, conscientised and mobilized in the “Anambra is my Home Philosophy”. Consequently, I ask the millions of Anambra indigenes living outside of the state: how much tax or financial contributions do you make to your state in a year--- the state/government that preserves and improves your “permanent Home Address”? To the extent that Nigeria insists on ‘state of origin’ as the defining feature of citizenship rather than residency, every Nigerian who lives outside of his state of origin is presumed by law to have at least TWO residencies. Why is there no mechanism for the sharing of taxes paid by such dual residents between their states of origin and states of residence? Imagine if Anambra state government gets back just 25% of all taxes paid by Ndi Anambra all over the country! Finally, we need to rebuild the foundation of our society—the values—that underpin our social capital and progress: hard work, trust, integrity, character, and community service. Our society died when we stopped asking people what they do for a living. Consequently, our Governor might consider reintroducing a course on “Civics, History and Entrepreneurship” in Anambra’s primary and secondary schools, (and even tertiary schools as part of the ‘General Studies’): What does it mean to be “Onye Anambra”? Education is in the concurrent list---and NECO/SSCE are based on ‘Common Core’ curriculum but nothing stops us from having ‘specialized and specific subjects’ as additional. It is said that the Igboman’s greatest strength is also his greatest weakness. Rugged individualism is what propels him to work 24/7 to excel in any endeavor, with the goal of building an empire by himself. In the process he forgets the power of collective action. In the end, all there is are disparate villages, all of which put together do not make an empire. The overarching emphasis on “Me”, ‘Myself’, and ‘I’, needs to change. Our focus on the micro means that we are still holed up in our villages and cannot think of Anambra beyond the prism of our villages. Most development efforts are village-based, and our politics and development paradigm have tended to mimic this micro focus. The language of our politics and development must begin to change. Yes, all politics is local, but development that improves the life of all does not necessarily have to be village-based. We must invest in our urban cities, institutions and other shared public goods. Measuring the performance of a government exclusively by what it has done for “my village” needs to change: We have to plan for and transform Anambra as one mega city (less than 5,000 sqkm). 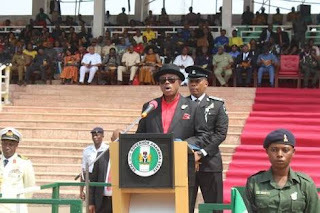 We commend Governor Obiano for building state-level institutions. I drove through Awka at night from Enugu, and I couldn’t resist joking to a friend of mine from Awka sitting with me that “Oyibo abata Awka”! At the business level, we must commend new forms of partnerships emerging among our businessmen. The Igboman’s unique business model is cooperative competition and networks play key driving roles. We need to reinvent the People’s Club philosophy, except that this time, it is no longer just a social insurance scheme, but now as a Business Council—with members from both the homeland and the Diaspora. We must mainstream citizens’ power: we get the kind of government we demand. As citizens, we commend the government where it performs, criticize where it errs, and contribute ideas if possible. That is our civic duty without which our democracy and sustained transformation cannot endure. Even those who will never see anything good in a government are also welcome. This is a democracy and opinions are free. Government’s resources are very small relative to need. Per capita annual budget of Anambra state is approximately N24,000 ($52- $79) or even half of this if you include indigenes outside of the state, while that of the FGN is about N38,000 per Nigerian ($81- $124). But entrepreneurial policymakers at the federal and state governments can become active enablers/facilitators of prosperity through provision of critical infrastructure, law and order, planning and regulation, and catalyzing the mobilization of needed finance. Anambra must be united in insisting that the FGN meets its minimum obligations to Ndi Anambra by quickly completing the Second Niger bridge; make Onitsha sea port functional; dualize the Anambra West- Lokoja Road; as well as fix the federal highways in Anambra; speedily grant all approvals for the Anambra cargo airport and contribute to it—Anambra is the 4th largest economy –after Lagos, Abuja and Rivers and all these have international airports. Anambra can become one integrated free trade zone with Dry port facility. These and more, should be the template against which we hold our elected members of the National Assembly accountable. IV: The Politics of the Unfinished Business and Challenge for the Working Willie! At the beginning, we identified three key features of societies that are successful transformers. Anambra has begun to get some things right. The challenge is continuity, plus plus! Every transformation is a continuous work in progress. We have carefully reviewed Governor Obiano’s Medium-term Plan whose vision is “For Anambra to become the 1st choice investment destination and most preferred location to site new industries”: it is a plan for institutionalizing modernization and wealth creation (we recommend that Ndi Anambra carefully study it and also give him inputs). Governor Obiano has demonstrated that he is a business friendly governor who is walking the talk on job creation. The automation/computerization/modernization of processes in government and institutionalization of change are commendable. I am particularly impressed by the effort to collect and process basic statistics: if you can’t measure it, you can’t improve it! These soft governance infrastructure are fundamental but often neglected. Like Singapore, Malaysia, Dubai, etc. did, we need to sustain the momentum of the implementation of the plan. Second, we urge Governor Obiano to look beyond his medium-term plan. As Governor and leader of APGA, we urge him to build upon his inspiring speech at the 2016 World Igbo Congress to actively engage in the ongoing debate about the political future of Ndigbo and the urgency of economic transformation of Alaigbo. We commend him and his colleague governors of the South East for announcing their commitment to active coordination of regional development. Furthermore, he needs to mobilize Ndi Anambra to build upon his medium term plan to craft a Grand 50 Year Anambra Plan—to be broadly owned by Ndi Anambra as the template for building and sustaining our emerging start-up state. Subsequent governments in Anambra should then derive their medium-term plans from the Anambra Plan. Governor Obiano must jumpstart the Anambra airport, even if on a public-private partnership. There are several funding options to explore. So, we have the first two ingredients in place. The third relates to having governments with reasonably long period to cement their vision. The Nigerian constitution allows a maximum of eight years for governors and presidents, with elections every four years. So, what do we do with Governor Obiano in this election year? Obviously, we expect candidates from other political parties to contest the election. That is their prerogative under a democracy. Of course, there are many reasons why people run for office. But let me say that the argument that Ndigbo or Ndi Anambra need to belong to PDP or APC in order to be “connected to the national grid” is a false argument. I once thought the same way. But evidence since 1999 has shown that there is no special advantage to any state government simply because the governor belongs to the same party as the President (except perhaps 10-30 persons that might be appointed to some federal positions). That is an elite talk, an elite game for the elite interest! Or perhaps some might join a political party so that the federal authorities might deploy the armed forces and INEC to write election results for them. It has nothing to do with the people and their welfare, period! What about Governor Obiano’s performance? Let me say that Governor Obiano, as the chief servant of Anambra, is not perfect. No one can be! Some have issues with aspects of his style; some have personal/political issues with him; some criticize his appointments or location of some of the projects; while for some, he is ‘not reaching out’ appropriately, etc. I am sure he hears many of these and obviously making amends where necessary. Since 1999, Anambra has not done badly on governance. Gov Mbadinuju rescued Anambra from anarchy and restored security; Gov Ngige showed Anambra that a government can tar some roads; Gov Obi took it further especially in his second term with roads, education, health and fiscal frugality. We have carefully gone through Governor Obiano’s Plans and performance vis-à-vis the resources at his disposal and context of Nigeria’s current economic and political situation, as well as in comparison with other states and even previous Governors in the first three years of their tenure. Governor Obiano is certainly holding the touch higher! The list is long, ranging from exemplary security of life and property, agricultural and industrial transformation with thousands of jobs, continuation of roads/bridges construction when most states cannot pay salaries, institutionalization/modernization of governance, taking Anambra towards fiscal sustainability by raising IGR 188%; extending health and education reforms, etc., etc. And the rest of the country is taking note as well: what with the various recognitions and awards! No governor of Anambra has been so widely recognized in his first three years since 1999! This is what Anambra expects and deserves: that every governor should build upon and probably surpass his/her predecessor. So, why mend it if it is not broken? This is a time of crisis and you don’t change the General in the middle of a war, especially the General that has led you through successes in battles. We have learnt useful lessons from the past and must now forge new elite cohesion and consensus. Let Anambra export a rare form of statesmanship politics. Can we then employ most of the contestants to rather deploy the billions of Naira they would soon waste on the campaign trail into building medium scale industries in the state? That way, even the politicians would be adding to the burgeoning start-up companies, and creating high value-adding jobs! There will be vacancy at Government House after the next four years, and anyone can contest. In the meantime, the Working Willie as our chief servant can continue to serve and lead Anambra as a truly emerging start-up state, while we, the people, collectively support and drive the investment boom! I therefore strongly endorse Governor Obiano for a second term in office. Happy third year anniversary, our Working Willie! The Senate has driven away the Comptroller-General of the Nigerian Customs Service, Hameed Ali, after he appeared before the lawmakers in mufti. Mr. Ali’s appearance without uniform, on Thursday after his failure to appear on Wednesday, was contrary to the resolution of the Senate which asked that he must wear “appropriate” uniform to brief them over the now suspended policy on duty payment. The Senate unanimously resolved to drive away Mr. Ali, following George Sekibo’s motion. The Senate further resolved that he should appear again next Wednesday in uniform, after the lawmakers took turns to chide the Customs boss. Shock, followed by pandemonium and palpable fear, enveloped residents of White Sand area of Isheri-Oshun in Ejigbo area of Lagos State, following the murder of a three-year-old child, Chiagozie Okereke, by a Muslim cleric, Kazeem Alimson, popularly known as Alfa. The incident, which was described by security operatives and neighbours in the area as ‘the most bizarre occurrence in the neighbourhood’ has sent shivers down the spines of residents. One 15-year-old boy, Simon Kanu, confessed to have been paid N500 by the said Alfa in order to lure the baby, adding that the baby was killed with a heavy stone in his presence. Governor Rochas Okorocha of Imo State has vowed that he will not hand over power to anybody from the Mbaise ethnic group or a former senator for the Okigwe Zone, Sen. Ifeanyi Ararume, saying age was not on his side. He said that the time had gone for anybody above 50 to dream of piloting the affairs of the state. Okorocha revealed that he would by September this year begin assessment of who would succeed him come 2019.